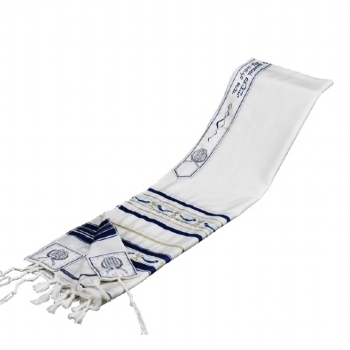 100% Wool Kosher Talis are made in Israel by the Mishkan Hatchelet Company, meeting the strictest standards of Jewish Law. The tag attached to them is provided by the manufacturer and certifies them as Kosher. Featuring the Shofar (Ram’s Horn) blown on the high holidays ribboned accross.